There is little more I can add to any of my previous market commentaries regarding the yen to dollar, which I haven’t said before! ( but I will try!!). Sadly for us as currency traders, Ben Bernanke’s circus failed to deliver the high wire act promised, and instead consisted of a series of pedantry performances with some lack lustre clowns, a performing sea lion, and some geriatric lions. Not what the doctor ordered at all, and as a result yesterday daily chart ended with a long legged doji balancing neatly on the 9 day moving average, and it was no great surprise to see prices head higher in early trading this morning. The 95.50 price handle remains intact, and it seems unlikely that this will be broken, so as traders we must be patient and wait for any trend to become firmly established before committing to any longer term trades. Hopefully we will see some sort of clear signal in the next few weeks. 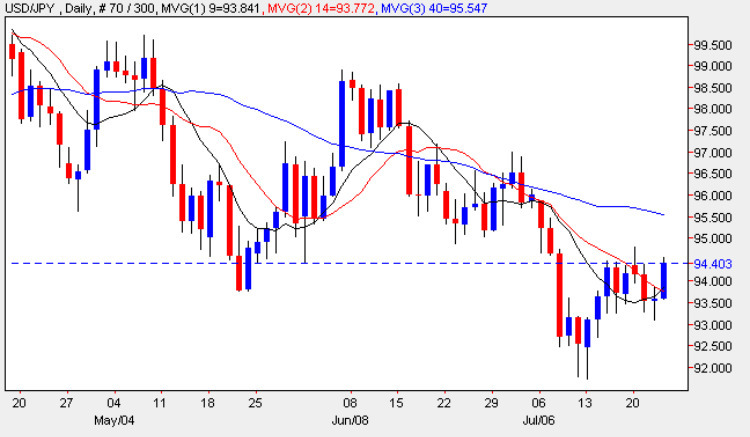 As for the fundamental news on the economic calendar, the main news for the Japanese yen came overnight with the release of the Trade Balance figures which came in worse than expected at 0.44T against a forecast of 0.51T with exports falling at a slower pace that previously, and suggesting that the worst of the recession may be over. The only other items of fundamental news ar due for release shortly in the US, and these are covered in more detail on the euro to dollar site.